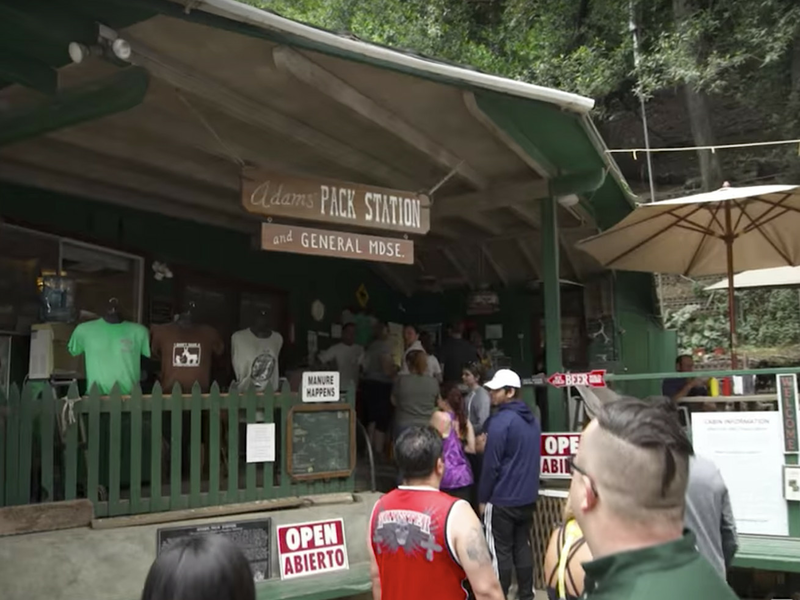 Los Angeles’s historic backcountry weekend restaurant, the Adams’ Pack Station, is up for sale. The iconic Angeles National Forest property is among the oldest of its kind anywhere, doubling as a respite for hikers to catch live music and grilled meat, and as a functioning donkey pack company that carries supplies into the remote wilderness. Adams’ Pack Station was founded in 1936 as a functional backcountry outpost for hot meals, mail deliveries, and other assorted goods needed for a weekend in the forest. At the time the National Forest was a hotbed of tourists and locals looking for a summertime cool down, with sprawling camps and resorts dotting the hills above Pasadena and all cities further east. Over the years most of these hard-to-reach camps fell by the wayside, though the nearby Sturtevant Camp is still active and linked to travelers via the Pack Station. On weekends, the Pack Station is a thriving rural oasis for beer, hot dogs, cowboy chili, and snacks. The place is filled with day trippers, cyclists, families, and pass-through hikers doing multi-day journeys, all of whom stop for a hot meal in the middle of the forest. Now the Pack Station is up for sale by longtime owners Deb and Sue Burgess. The pair is selling off the entirety of the property and the US Forestry Service operation permit, which includes an on-site home, a bunk house, the barn, the donkeys, and all the necessary restaurant equipment and paperwork, including a license to serve alcohol. In an email sent to customers, Deb Burgess says the current asking price is $500,000. Got an itch to truly get away from it all? Email the Adams’ Pack Station directly. Adams’ Pack Station. Chantry Flat Rd., Arcadia, CA.